205 years ago today Admiral Lord Nelson was mortally wounded during the battle of Trafalgar. Engaged in battle with the French ship Redoutable, Lord Nelson was struck by the musketball of a sniper. The shot hit his left shoulder but traveled to the base of his spine, his backbone had been "shot through". Three hours later one of Britian's beloved naval heroes had lost his life during the decisive victory. Nelson "England confides that every man will do his duty"
On January 9th 1806, after five days of ceremonies, Lord Nelson's final funeral service was conducted in St. Paul's cathedral. 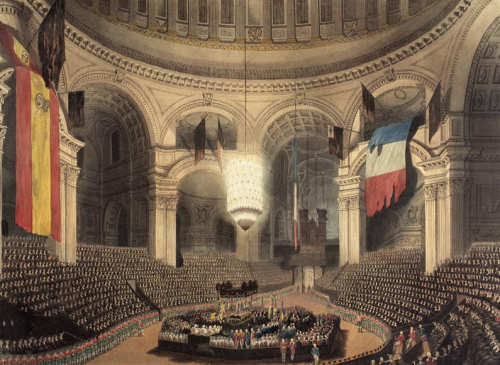 Under the glow of a specially made lantern, flanked by captured French and Spanish ensigns, thousands of mourners gathered to see Nelson laid to rest under the great dome. 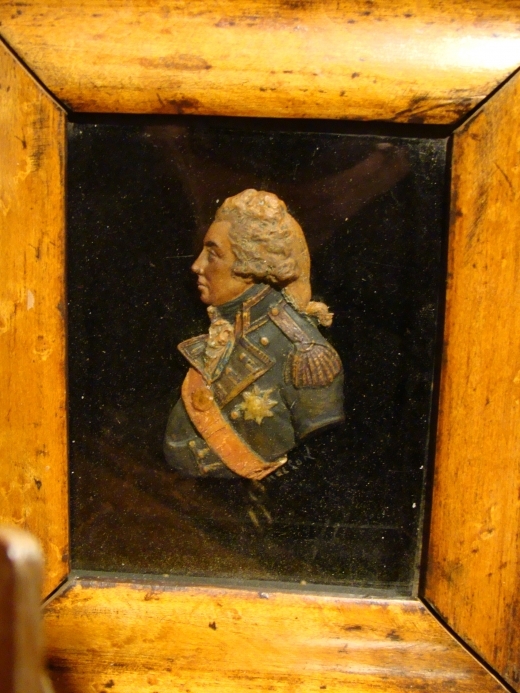 This wax portrait depicts Lord Nelson dressed in his naval uniform decorated with the Naval Gold Medal and his breast star of the Order of the Bath. Nelson received these medals for the victories at St. Vincent and the Nile. In the summer of 1797, during the doomed battle of Santa Cruz de Tenerite, Nelson was shot in the right arm. The surgeon abord the ship HMS Theseus had to amputate most of Nelson's arm. Always one to inspire, Lord Nelson was up and giving orders within 30 minutes! 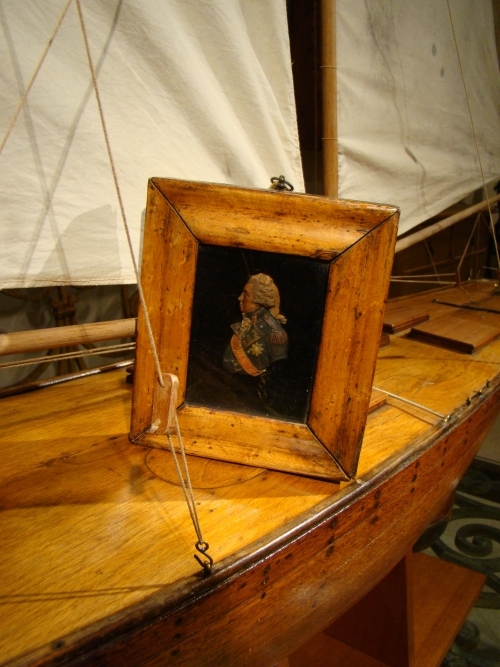 In the wax portrait you can see Nelson's right coat sleeve tucked across his body. Wax portraits are made by first carving the figure to create a master mold. Once the model is complete the negative image is made from a Plaster of Paris type mold. Multiple copies can then be made from this master mold. Wax is then heated and pigments added to match the color of hair, flesh, or whatever the model requires. Color by color the wax is warmed and pressed into the mold to build up the image. The portrait is removed from the mold and cleaned up with hand tools to remove any casting marks. Any other color details are then painted on the figure. Finally, as in this case, the wax portrait is mounted on a piece of glass painted black on the reverse. Appreciating the time and energy you put into your site and in depth information you offer. It's great to come across a blog every once in a while that isn't the same unwanted rehashed material. Excellent read! I've bookmarked your site and I'm adding your RSS feeds to my Google account.